So long, and thank you for the music. This year, in some ways, has been amazing for us as a musical duo. 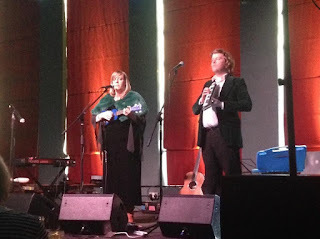 Highlights include supporting Mercury prize nominee Kathryn Williams, upstairs in renowned live music venue Leaf, Liverpool, playing to a huge audience, and having BBC 2 DJ Janice Long, who attended, say of us on her radio show that we were "mesmerising". Later this year we were honoured to support Louise Jordan at the Liverpool gig of her tour, upstairs in the intimate setting of the View Two Gallery on Mathew Street. 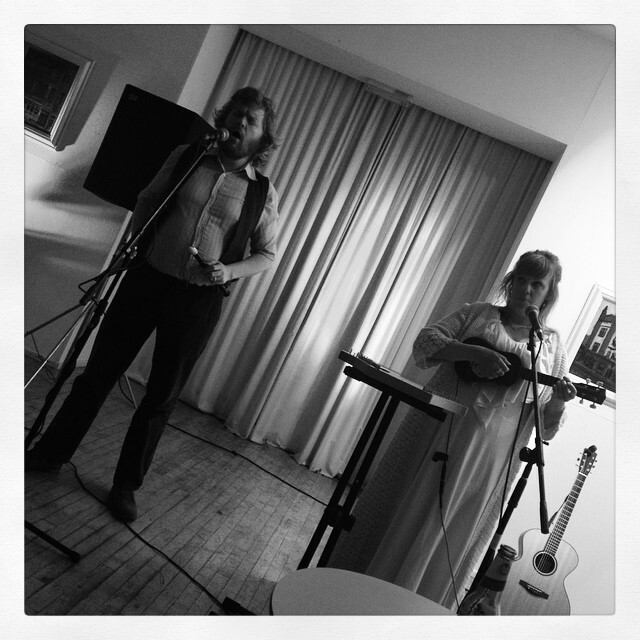 Amongst those fond gig memories of this year we have to include a lovely, festival-feel gig at the Bombed Out Church (the venue in which we married in 2014) with our folk duo friends Penmann, too. This was also the year we released our studio-recorded CD, Amateur Astronomy, to reviews which included comments like, "the sound of the resilience of humanity", "one eye on the music of the past but also one foot in amongst the stars" and " addictive and eloquent". Ruth also wrote, and performed the violin parts for, a string arrangement on a song by The Loungs, an indie band with a large following, and seeing her name on their CD sleeve was definitely something of a buzz. We had our single, Ella Brown, played by Mike Brocken on BBC Radio Merseyside, which was an amazing feeling. We really thought that this might be the year we started to make some headway into finding more people who really wanted to listen to our music. We've never craved record label interest, or huge numbers of fans, or making vast amounts of money. What we've wanted, always, is to make music that we love, that really touches people's hearts, making them feel and think... and for our music to reach those people without us ending up utterly out of pocket. However, after the highs of the summer, with its magical gigs, and the feeling of finally holding in our hands a copy of a CD that held our own music, our original songs, written, arranged and performed entirely by us (and made to sound fantastic by magic-working producer Andy Bowes), came the autumn. Album sales were already disappointing by then. Given so many bands keep figures a secret at the risk of losing face, we're going to be totally open: we had 100 CDs made; we'd have preferred 50 but the cost per CD was so much cheaper at 100 that we went with that, but set ourselves the more reasonable target of selling 50. Our launch gig didn't go as well as we'd hoped, and although some lovely people ordered multiple copies of our CD to give to friends, all in all we have sold 37 to date. The CD was make or break for us, and it broke us. Being online is also a demoralising experience; asking - begging, in fact - for "shares" but getting instead a handful of "likes" and even then only if we're lucky; asking people to listen to our music on Bandcamp and finding out most people stopped listening way before the end (in some ways being able to see statistics is really useful; in other ways it's a complete downer), and the awful self-doubt, and occasionally green-eyed monster, that creeps in when similar artists seem to have huge comment threads whereas we have tumbleweed. Constantly trying to work out if our music is just awful (and if so, why such good reviews?) or if we're somehow not playing the online game properly - is there a rule sheet? And what's the rule about buying music from and promoting online the music of other musicians - is it right to expect quid pro quo or not? How does it work? We've never found out any of answers to these questions, and suspect we never will. Then came our worst gig ever; we've played to empty rooms before so it wasn't that, but it was the way the audience completely disappeared after the performer before us finished his set; we'd hoped people might stick around, but watching the large audience dwindle away to next-to-nothing before we were due to play, seeing scores of people leave as we picked up our instruments, was demoralising in a way that's hard to describe. It didn't help matters that at that point, Ruth was ten weeks pregnant, tired, and feeling a little faint; sadly the next day a scan revealed no heartbeat and shortly afterwards, the pregnancy came to an end of its own accord. Obviously the two were in no way linked, but any resilience we might normally have to cope with such musical disappointments disappeared with the ensuing grief. 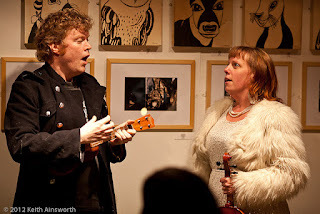 We also had to cancel a gig as Ruth had to go to hospital; having never cancelled a gig before we felt terribly guilty but it simply wasn't possible to play. We thought about stopping there and then, but we couldn't quite let it go on that note. We'd planned to do a Christmas gig, as our 2014 Christmas gig had been so magical,but when we asked on our Facebook page who might be interested in attending, we only had a handful of replies so decided against it. In the end, we did play a gig at Christmas (as it was organised by someone else)and in fact, it was rather lovely. We played for half an hour in West Kirby library on the concourse to a relatively small but very interested audience, playing some carols and folk music, and just one original song. It was somewhat redolent of the very first time we'd played in public, back in 2012, as carollers, but our musicianship was infinitely better after three years of practising and playing together. And so, that's it for Moss & Jones. We've managed to go out on a high note; the Wirral gig was a lovely experience; we even sold one of our CDs. However, we need a clean break from music, at least, from promoting, organising and feeling never-quite-good-enough about it. What we plan to do is sing around the piano at home, save up to buy Ruth a decent violin and Marc a better accordion, practice the instruments we have, and play together for fun, and get Ruth's son - Marc's stepson - involved too, if and when he wants. It seems to us that perhaps we went about things the wrong way. Maybe we didn't reach enough of the people who love the sort of music we make; maybe we did, but our music just wasn't quite impressive enough to make them rave about it. Whatever the reason, we couldn't quite make it work for us. Our CD, Amateur Astronomy, along with the rest of our digitally available music, will remain on sale for the next six months on Bandcamp, so if you do want to grab yourself a copy of a infinitesimally small piece of musical history from the folk music enclave, now's your chance. We're grateful to the people who've listened to our music, bought our music, reviewed it, blogged about it, promoted it, encouraged us, given us pep talks, given us advice (yes, even unsolicited - thanks to a very dear friend who gave us the nudge to arrange our songs better), retweeted and shared our posts online, arranged gigs and put us on, let us use their venue, designed artwork for us, loaned us instruments, produced our music, organised open mic nights, bought our CD for their friends, played us on the radio, attended our gigs, brought friends to our gigs, and subscribed to our newsletter. We suspect that one day we'll feel brave enough to put outselves out there in public again, but if we do, it won't be as Moss & Jones. If you'd like to stay with us if and when we embark on that journey, please email us - mossandjones [at] gmail [dot] com - and let us know, otherwise we'll take this opportunity to say goodbye, now, and thank you so much for the support you've given us. "Summer won't be here forever - autumn will creep up on us before we know." - Shepherds' Delight (It's Not Time To Go To Bed), Moss & Jones. We played a couple of gigs at the end of the summer... one at the Rendezvous, St. Helens, as part of a vintage fair (we played and sang 'oldies' on the piano, rather than our usual folk repertoire), one at Victoria Park, St. Helens (which we also compered) and one at The Brink, Liverpool, as part of Hope Fest. The first was great fun; the second was very hectic and stressful but we appreciated the opportunity to reach a potentially wider audience; the third was very quiet but those who were there seemed to really enjoy themselves, and it was for such a good cause. Unfortunately very shortly after those gigs Ruth became ill and had to attend hospital (nothing, we hasten to add, to do with any of the gigs). Ruth's slowly but surely on the mend now, but it has given us a chance to reassess what we're doing with Moss & Jones. Obviously, we would still love for you to buy our CD (and if you have already, and you liked it, feel free to write us a little review on your blog, or Facebook, or twitter and @ us in) and we still welcome radio and podcast airplay, but in terms of gigs, we're going to have a little rest. We normally put on a Christmas gig, full of carols and Yuletide songs, but unless people are really clamouring for such a thing (or unless a venue wants to pay us to put on such a gig and help with the organisation...) we're going to take a break from gigging until the new year, although you can download our Christmas carol from last year if you like to 'tide you over'! Come the new year, we want to try to build up more of an audience, so that when we put on gigs ourselves we can be assured of a reasonable turnout. We're going to take it all 'back to basics' - go to more open mic events, attend folk clubs, possibly even go busking... we're going to use the interim time to practise our instruments, and just play together for fun. It's so easy to lose sight of that side of things, what with having to have a 'social media presence', an up-to-date blog, a CD to flog in order to try to at least break even, 'networking' to try to do, and so on... it's meant to be fun after all. When we started this, making music together, we agreed that if it ever stopped being fun all together, we'd stop. To be honest, we nearly did... but instead, we're going to make it fun again. It can be really easy to doubt yourself when you think no-one is listening. When you lose confidence in what you are doing and questioning why bother. Stop and think about all the experiences that you could have missed out on, the people you might never have met, the people you now call your friends. We have come to accept - to some extent - that people will listen to music but not necessarily buy it, and learned not to measure success in terms of breaking even (although in the long run, I can see this leading to many independent musicians simply stopping recording albums, though not necessarily ceasing to make music. More on this in another post perhaps). However, I do still have a bad habit of totting up numbers of plays of songs. Surely part of the point in writing songs is for people to hear them? Well, it's easier to start with reasons that some sometimes cite, but which aren't the case for me. I don't decide what will make a song popular and work backwards, though it is tempting sometimes. The songs definitely don't 'write themselves' (although the initial spark is sometimes unbidden). Then things that I fear might be true. And what I know to be true, though it sounds a little narcissistic. I need to tell my stories, and share my ideas. Maybe if I look at the songwriting process, that will give me some ideas too. With many of my songs, they've started off as snippets, that have come into my head almost unbidden. What's made me see them through? I enjoy the process of writing songs (not always). I want to hear the finished song myself (I need to hear the finished song myself)! But it's also important to think about what I've learned about how the songs I've written are received. When I'm writing, I have an idea in mind (e.g. Shepherds' Delight is in part a memento mori). However people don't always see that, and sometimes, they even see something else, something that I didn't put in there (the lovely chap at a gig who said it sounded like a baby's first lullaby). It's as though the songs, released, take on their own life, their own personality, they reach people in different ways. And, just like one's own child or children, a songwriter has to accept that their songs aren't necessarily going to 'take after' them. That's actually quite hard sometimes. I'll think I've written a song of nostalgic longing... someone else hears a pretty jaunt (and vice versa). So even if I was writing songs to reassure myself there were people out there with the same emotional responses as me, that I wasn't alone... I'd be on a hiding to nothing. Once the song has been 'released' (both in the music industry sense, and figuratively), it develops ideas of its own. It is like a child.... from the moment they are born they develop their personality, and an important developmental stage is when this personality starts to develop in completely distinct ways to their parent's/s' personality, and they are able to and allowed to take pride in that difference, to be themselves. (I'm speaking from experience here as a parent, too, before you tell me to get in the sea.) Good parents encourage this, accept that their children are different people to them, and love them for the people they are, take delight in this entirely new personality, find joy in watching them develop in ways they might not have guessed. My songs - I like that they are now separate to me, I still love them, but I love watching people react to them in ways I'd never have predicted. They have a life of their own! So why do I write songs, then? It is simple, really. I write them so I can hear them, hear how my stories sound in their voice. But I release them so I can watch how they play with everyone else. With my nearest and dearest. With YOU. Are you a songwriter? Why do you write songs? Feel free to comment! *Marc writes Moss & Jones songs too, of course, and one of them is on our album - it's the title track, in fact - and obviously, our arrangements are pretty collaborative. But songwriting is so individual that I can't say his reasons for writing are the same as mine. **I don't feel I need to write about this as I think Gary Maginnis' post speaks for most of us. You see, I remember 1997, when I was a student at Liverpool Uni, and helped promote a poetry-only open mic event at Liverpool's veggie hangout, the Egg Café. The event changed hands shortly after I'd left university, and it started to welcome musicians, too; I moved to London shortly after that, and didn't attend for a good many years indeed, but it continued, changed hosts yet again, and by the time I started singing unaccompanied folk songs in 2011... it was still there. 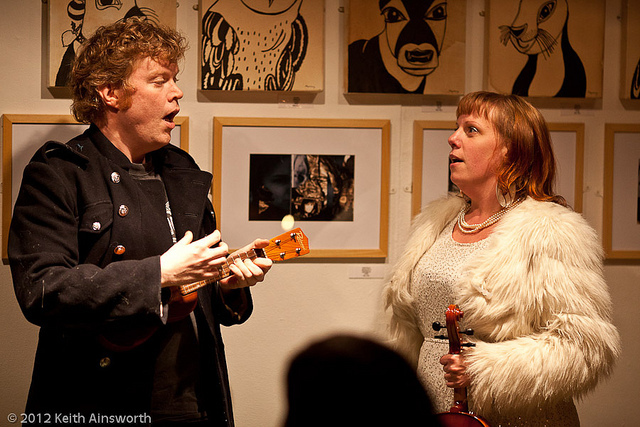 In fact, it was the scene for mine and Marc's first ever gig together, in 2012, when we were two people singing and playing some carols, rather than Moss & Jones. It's still going now, 18 years since I first started going. (In fact, it isn't the longest running open mic in town; that honour goes to the Dead Good Poets, at least, as far as I'm aware. But it's probably the longest running open mic that isn't just poetry.) It's changed so much in those years. Even in the last four since I started going again, I've seen a turnover of 'regulars' several times; sometimes it's students who come and perform for a year or so and then leave town on graduating; sometimes it's musicians in the early stages of their career who use the Egg's welcoming open mic as a starting board, and when they get a little more well-known, they go less often to open mic events; sometimes people just decide they prefer a different open mic, maybe one with a microphone, and take their friends with them. But new people always come and take their place; keep things going and busy. And certainly since I've been part of Moss & Jones, Tony Kehoe has compèred the event, his idiosyncratic presenting skills including lyrics performed as poetry, in addition to performing his own songs. A friendly chap, Tony always encourages the audience to give performers - especially new performers - all their support. His exuberance might take a little getting used to for newbies but it's definitely worth it. Last night, Monday 3rd August, included the usual mix of poetry and music; covers and originals; it's great to see Tony Kehoe's daughter continuing to develop her skills as a singer and musician; Tony had some new songs which we enjoyed; there were quite a few of us who'd travelled over from St. Helens so it felt like we had a bit of a gang there, though the atmosphere is always supportive anyway. We played a couple of songs too and people seemed to like them; friends played new songs too and read old poetry and it was all marvellous. One of the things I love about performing at the Egg is that it's completely unamplified. It's open mic in name only; a more appropriate phrase might be 'open floor'. It's great for us; that's how we practise of course, so we're very used to it. There's also no stage as such; performers are on the same level as the rest of the audience; they are on the floor, standing just in front of the people listening. For me that's a wonderful thing; it emphasises the fact that performers, too, are audience; there's no getting up and nipping to the pub for a pint once we've done our set; we stay, and we listen. Sans microphone and sans stage there are no barriers between performer and audience and personally, I really like that freedom. On a practical level, not having to sing through a microphone means that I am able to move a little more too whilst singing and playing. There are no wires and cables to trip over, either, and the sound is solely determined by mine and Marc's performances, not partly by an engineer. That does, of course, mean that if performing at the Egg, it's wise to remember this, and if used to singing through a microphone, it might be wise to increase the volume a bit. We now go to a variety of open mics, and play various full gigs too (this Sunday, we'll be back at the Bombed Out Church), but the Egg was where we started, it's my favourite café in town (I've been going since my late teens, so it's always been the Egg for me, rather than the Acorn) and we'll always go back to play every now and again... as long as they'll have us! The open mic at the Egg runs the first Monday of every month except if it's a bank holiday, in which case it's the first Monday after the bank holiday Monday. We had an absolutely wonderful evening last night at the ever-relaxing View Two Gallery. It's always strange to think, when sat there in the chilled out environment, surrounded by art, that down a few flights of stairs and out of the door is Mathew Street, Liverpool's home for revellers and merry-makers. We arrived a little early which gave us chance to soundcheck (and spend half an hour tuning our now-ancient mandolin, which slips out of tune with so much as a look), have a cup of tea, and just relax. We got a little chance to talk to Chris Callander and Esme Bridie before the show began; Louise Jordan then arrived after having had an epic - and not particularly fun - journey up to Liverpool! After her soundcheck, the event started, first with Esme. Esme immediately wowed the audience with her lilting voice and assured guitar playing. Our favourite of hers was a song called "Dirty Hands", with some captivating chord changes. We would really like to go and see Esme play again. Next up it was our turn; we had brought along many of our instruments, but also made use of the gallery's wonderful grand piano. We played classic folk ballad Reynardine (Roud 397), b-side of our recent single, and then a selection of original songs, including a live version of (There's No Such Thing As) Wandering Stars, which we sat at the piano together to sing and play. Due to us both being sat at the piano, we went completely unamplified for this, but were told afterwards that our voices still carried. 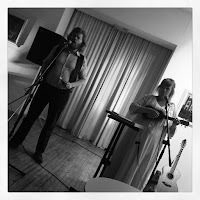 We played a variety of songs from our début album, Amateur Astronomy, including the title track from the album, and a shorter live version of our epic mediaeval-themed song, Stars and Moon and Me and You, Love, for which we used the psaltery unamplified; the sound is pretty loud even without a mic! We finished with an a capella song, When I Was Your Age, which is not currently available for streaming but is a bonus track on our album. We had a wonderful time performing but were glad to sit down and grab a coffee! Next up was Chris Callander. Chris' songs are honest and passionate and his guitar playing is pretty much virtuoso! We especially loved his wonderful song Ghosts of the Old Casartelli, and spent a while racking our brains trying to work out where the landmark was! A wonderful set, and we've thoroughly enjoyed listening to his CD today too! Finally came the headline act, Louise Jordan. Louise is a skilled musician; a lilting pianist and fluid guitarist. Her voice is a joy to hear; she makes it seem so effortless and weightless. She played beautiful, interesting songs, many in that folk tradition where the telling of the history behind the song is as much a part of the act as the song itself. Hard to pick a favourite, but her musical interpretation of the AA Milne song, Rice Pudding Again, was strangely haunting for a lullaby. We bought her latest album, Veritas, and played it in the car on the way home. It's fantastic, and we would recommend it to all of you. We hope she got back safely and that she returns to Liverpool again, soon. Thanks to everyone who came; thanks to Graham for putting on such wonderful acoustic gigs; thanks Stuart for the sound, and Ken at the gallery for holding the event; finally thanks to Esme, Chris, and of course Louise for the wonderful music! We've been blessed with another wonderful review of our début album, Amateur Astronomy, this time from prolific music writer, and poet, Ian D. Hall, at Liverpool Sound and Vision. "...ample splendour offered by Moss & Jones..."
"...captures the imagination and asks questions of the listener..."
"In Amateur Astronomy they have one eye on the music of the past but also one foot in amongst the stars." If you'd like to hear the music for yourself to see if it matches up to the review, you can stream it for free from Soundcloud or Bandcamp, and it's available from Bandcamp as a CD for £5+postage (Royal Mail: 95p in the UK) or as a digital download for £4. Both CD and download contain a bonus track not available for free streaming. Labels: amateur astronomy, english folk music, folk music, ian d. hall, liverpool sound and vision, mediaeval, moss & jones, moss and jones, music, Music reviews ... of our music!